The only surviving Titan II ICBM missile silo open to the public, complete with a deactivated missile, its launch control centre and all other support equipment still in situ. The site, near Tuscon Arizona, has been preserved as a "museum" to serve as a reminder of what was once the USA's most powerful component of its land-based nuclear deterrent. It's a unique site illustrating the superpowers' frightening MAD readiness for all-out nuclear Armageddon during the Cold War era. As such it is one of the prime sites worldwide for nuclear tourism – or for any dark tourist with an interest in this most disturbing side of contemporary history. Guided tours include a simulated launch sequence – i.e. a simulated start of the nuclear apocalypse that would have been World War Three. It's both mega cool and mega scary at the same time. More background info: Titan was an ICBM design of the late 1950s and early 1960s, the main Titan II version was deployed in 1963 and saw service for over 20 years as part of the USA's nuclear deterrent during the most scary phases of the Cold War. The deterrent apparently worked, though, as the Cold War was indeed prevented from turning "hot". So Titan's contribution to America's arsenal has to be counted as a success, even though, no, because none were actually ever fired as weapons (only in tests). Titan rockets were also used in "civilian" space programmes, most famously in lifting the Gemini capsules into space in the mid-1960s, with which the USA caught up with the USSR in the "Space Race". Gemini can be seen as the precursor to the later Apollo moon landing programme. Titans were used as space launchers (for satellites) up to as late as 2003. It thus has to be one of the USA's most successful rocket designs ever. Titan, however, was always primarily an ICBM design, i.e. a deadly tool of war. As such it was the most powerful single weapon the USA ever deployed: its re-entry vehicle (RV) contained a W-53 warhead with a yield of 9 megatons – the most massive thermonuclear device ever put on a missile by the US (only surpassed by the older B41 air-delivered nuclear bomb that had a theoretical max yield of 25MT, or by some versions of Soviet missiles whose warheads went up to ca. 15 MT). Just one such powerful H-bomb could take out an entire metropolis like New York or Paris. Its fireball alone would be something like three miles in diameter and leave a mushroom cloud rising 25 miles (37 km) into the atmosphere … as tests such as Ivy Mike or Operation Hardtack's Oak shot in the Pacific demonstrated – the latter using a precursor of the Titan's warhead. And the missile itself – it too was a powerful design in itself and a major technological advance at its time. Titan II's predecessors, or later space rockets such as Saturn, typically used liquid rocket fuels that were so volatile and had be kept so cold (hydrogen and oxygen in particular) that they could not be stored inside a missile. That meant that before it could be launched, a time-consuming fuelling operation had to be done – and even worse, older designs like the Thor or Atlas missiles were stored horizontally so that they even had to be erected first before fuelling started. All this could take over half an hour. As warning times for a possible nuclear attack got shorter, precisely through the use of missiles on both sides, such lengthy processes would have made such missiles very vulnerable to destruction in a first strike. Titan eliminated these shortcomings by being launchable almost instantaneously and directly from its heavily protected silo. The downside was that this required the use of some real nasty toxic chemical cocktail as liquid 'bipropellant' hypergolic rocket fuel – i.e. consisting of two components, one a stabilized hydrazine-based mix, the other a nitrogen tetroxide as oxidizer. Not only are these substances highly flammable (naturally!) but unfortunately also highly corrosive and pose a serious health hazard for fuel handlers, who thus had to wear spacesuit-like "fuel-handling suits" when dealing with the stuff. But all of this was taken into account for the overriding advantages of such fuel: firstly, the two substances ignite on contact – so no complicated ignition system was required in the missile engine, it was enough to simply pump them both into the engine cone and off it would go. Secondly, unlike other liquid propellants these substances were stable enough to be storable inside the missile (though it required some temperature control). This made it possible to have the missile on instant readiness alert all the times. From the launch command to the missile's actually leaving the silo only 58 seconds were required. That's certainly an impressively short response time. However, once the missile was brought on its way it could not be called back, stopped or remotely destroyed. As my guide put it: there was no "oops" switch. Once launched the missile would complete its trajectory and deliver its deadly payload to start nuclear Armageddon. The main downside of the missile's fuel cocktail was not just its toxicity, but also the risk of self ignition if the two substances accidentally met, e.g. due to a leak. A particularly dramatic accident happened in 1980, in Damascus, Arkansas, when a tool dropped by a serviceman caused a rupture in the missile's fuel tank. The silo was evacuated and measures to vent the fuel fumes out of the silo began, but the worst could not be stopped: the missile exploded in its silo, blowing the 750 ton silo door off and depositing the second stage and the warhead hundreds of feet from the silo. Luckily the safety mechanism in the warhead prevented a nuclear detonation. But one guy was killed by the blast. (This accident was later dramatized in the TV film "Disaster at Silo 7".) The worst accident by death toll happened in 1965, when during repairs, 53 civilian contract workers were killed in a fire inside another Titan silo in Arkansas caused by a welder igniting hydraulic oil. The workers died of asphyxiation. The missile, however, remained undamaged (and was unarmed at the time). Not least due to such risks involved in the system's design, the Titan II silos were all decommissioned between 1982 and 1987 – to be completely replaced by the more modern Minuteman II & III, which are solid-fuel propelled rockets and thus safer to store in silos. The three-stage Minuteman is also lighter, with a smaller warhead, but with greatly enhanced accuracy, making the oversized warhead of Titan's proportions unnecessary. 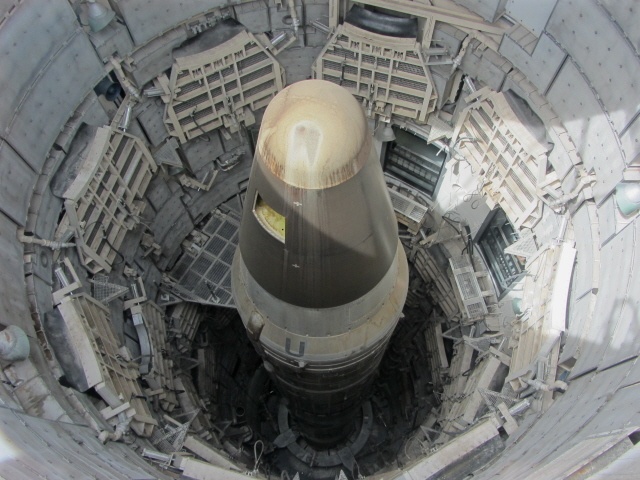 The Minutemen III arsenal is still in service and forms the core of the USA's current land-based nuclear deterrent. (See also Minuteman Silo). All Titan silos were deactivated, emptied and then demolished between 1982 and 1987, except this one in Arizona. The Titan II missiles themselves were either broken up and scrapped (mostly at Tucson's AMARG facility) or refitted to be used a satellite launch rockets. Only a small handful survive as museum pieces – e.g. also at the National Nuclear Museum in Albuquerque or the USAF Museum in Dayton, Ohio. This silo near Tucson, Arizona, was preserved in its entirety and converted into a "museum", and then fitted with the presently displayed training missile, and opened its doors in 1986. In 1994 it was declared a National Historic Landmark. It is not the typical kind of museum, however. There is a small exhibition space, purpose built next to the site, which also houses the administration and archives. But the main "exhibit" is the original silo itself. Everything in it, except for the replacement missile, is original – and quite a lot of it even remains in working order, at least crucial parts of the electronic installations. This makes it possible that the "highlight" of the standard guided tours is a simulated launch sequence, with all the noises and flashing lights this involves – just not the actual rocket launch. Apparently guides often let the youngest member in the group turn the launch keys. This is what makes some people cringe – a simulated start of World War Three as child's play! The Lonely Planet Bluelist 2007 describes sites like this as "tasteless but fun". That remark had made me ever so slightly sceptical about the nature of this museum prior to my visit. But now that I've actually been to the place I'm not so sure LP was right putting it like that. I can't completely deny that there is a certain black-humoured element involved here and there. But I think that's more a psychological compensation reaction in the face of the inconceivable horror that a real World War Three would have meant. Personally, I never had any "let's nuke them Ruskies" feelings of glee or anything like that which could be called "sick" or "bad taste"; nor was that sort of thing what my guide meant when he said at the end of the simulation, "welcome to World War Three, because that's what it would basically have meant" – it was more to put the technical sequence into the proper perspective, instead of it just being playful fun. OK, I was on a private tour with just the one docent – in a regular group tour the group dynamics may be different, I don't know. However, our path crossed with that of two groups while we were down there, including one group as they were getting ready for their launch sequence simulation. I didn't see any gleeful smirks on the faces of any of the members of this group either. Of course, I can't rule out that it does happen, but on all reviews I found online, only one contained a certain disrespectful element that might be seen as "out of order". On the contrary, overwhelmingly it all had a much more "educational" atmosphere. Why the classification as "sick but fun" by the Lonely Planet book remains beyond me. I suspect it's more to do with the usual 'moral panic' reflex that you often get among journalists when it comes to anything that's dark and touristic. Ignore it. Don't let it put you off. But back to the silo itself and a final little (though high-profile) bit of trivia: the site was used in 1996 for filming several scenes for the movie "Star Trek: First Contact". In these scenes the Titan missile "played" itself, as it were, however not as an ICBM, but as the fictional conversion to the launcher of "Phoenix", the first "Warp drive" vessel in Star Trek's fictional historiography. If you've seen the movie, or even are a devoted "Trekkie", then you have yet another incentive to go and see this missile silo! What there is to see: Primarily, this is a preserved genuine missile silo complete with missile and all support infrastructure, including a complete launch control centre. So it is hardly your average typical "museum", as the name might imply – nor is it a museum of missiles (plural), it all revolves around just the one: a Titan II intercontinental ballistic missile (ICBM) from the height of the Cold War. Naturally, this is the single most impressive star exhibit of the site. There is, however, also small museum exhibition as well – just a single room in the visitor centre, shared with the reception desk and a small shop. You can go through the exhibition first – or go back to it after the guided tour of the missile silo complex as such … because that's what you're here for. In theory you could just view the exhibition/shop alone (for free even) – but it would be ludicrous to come here and not go on a tour. Therefore the focus here shall be on a description of what's to see on the tours. But we'll come back to the add-on exhibition afterwards. There are regular tours and special tours. The former you just turn up for on the day, the latter need to be pre-booked (see details below). When I went to see the Titan silo site I had arranged for a full private tour of the entire complex, top to bottom. But I will first focus on the parts that everyone gets to see on the regular tours. After a short introduction, aided by some video footage and photos, visitors are first led around the open-air parts of the complex. 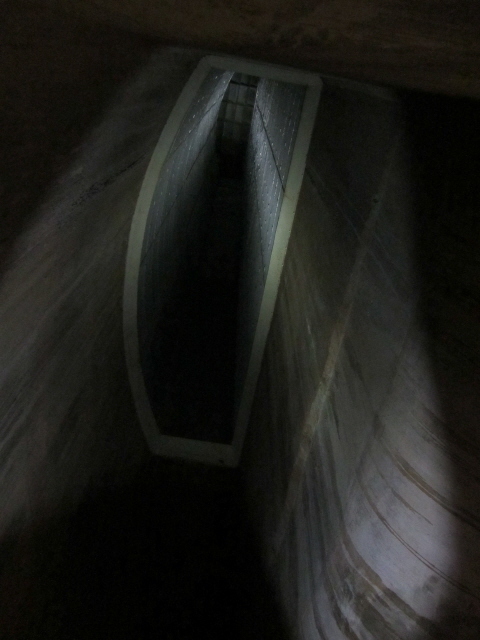 This takes in the main highlight – a view down to the 103 feet (31 m) long missile as it is standing in its silo! To allow for this, the 750 ton steel-and-concrete silo "door" (lid, rather) is left half-open. It's actually permanently fixed in this position, in accordance with disarmament regulations agreed with the Russians, to make sure no missile could ever be launched from this silo. So the opening mechanism would no longer work … but you can see sections of the rails that it used to move along when the lid was opened through its hydraulic mechanism. The open section is covered by a glass roof to protect the missile below from the elements. Depending on the light situation you may strain to see the lower levels of the rocket. Still, the sight of the top of the missile from above is nothing short of awesome! Note the little cut-out in the missile's tip. This, too, had to be cut to provide visual proof that there is no warhead on this missile. The radio communications equipment of the complex includes several back-up antennas ranging from ultra-short wave to long wave to ensure the most important function of the silo other than its own internal operationality: that the Strategic Air Command (SAC) could actually reach it under any circumstances, even after a first strike in a nuclear war. To ensure that, the several back-up antennas had their own protected silos and could be extended from them remotely by the crew in the launch control centre. For demonstration purposes, all these systems are out so visitors can see them. But they remain a comparatively abstract and "dry" element of the tour. The launch control centre, where you run through a simulated launch sequence, is the other highlight of the tour (apart than the missile itself). It's not so much about all the gear, the electronic equipment you see crammed into this rather modest space. It is more that here you get an understanding of how the operation of this most deadly weapon system would actually have worked. The missileer crew consisted of merely four persons – working in pairs (each led by an officer) who took alternating shifts, so that the launch control centre was continuously staffed by two missileers ready to spring into action at any moment. They were by no means necessarily men, by the way! In fact, from 1978 missileers have been quite frequently female. The two missileers on duty had a desk each with the crucial controls, facing a wall with racks containing yet more electronic gear. You also see the monitor that relays what the camera at the secure entrance "sees" – when I was there I saw another group of visitors descending those stairs … A stack of cabinets to the left includes the one that stands out by being painted red, and secured by two padlocks. This is where the secret codes for activating the launch sequence would have been stored. Once there had been the authorization order from the president, the cabinet would have been opened and a complex process of matching secret codes against prepared counterparts held in separate envelopes would begin. In the process it would also be determined which of the three pre-programmed targets would be chosen and whether the warhead would be switched to an air-burst or a ground burst. In our simulation it would have been a ground burst – which suggests a so-called "hard" target, such as a command bunker or an "enemy" missile silo, rather than a city. Incidentally, what exactly these pre-programmed targets would have been remains classified information to this day! Once everything is prepared, including the setting of the code for the release of the fuel valve, the system is ready for launch. Contrary to popular belief it's not some red button that is hit to initiate nuclear Armageddon. No, it's two keys – regular safety lock keys familiar from everyday life. These had to be inserted into the two command desks – to be operated at such a distance from each other that it made it impossible for just one person to do this… just another safety precaution in a long chain of safety measures. 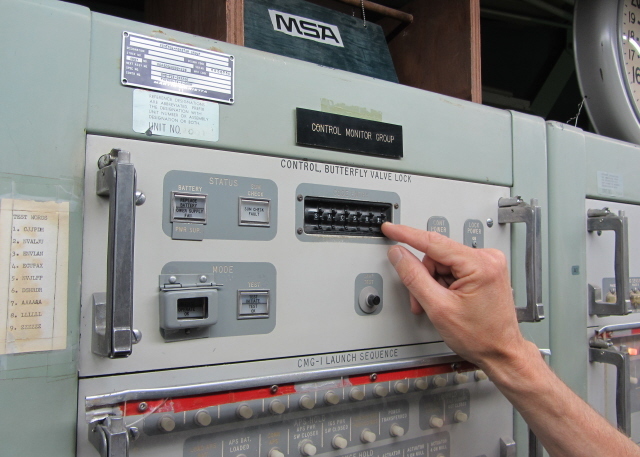 The keys need to be turned simultaneously and held in position for a number of seconds, then the automated sequence commences with lots of scary sounds and flashing lights indicating readiness of the missile, opening of the silo door, ignition and lift-off. It's all over in just 58 seconds. The next question you may possibly also be asking yourself at this point is: and what then? What would the crew have done after the launch? Simply wait for the end of the world? Inside their control centre? In their beds? Would they have gone outside? The quasi "official" answer my guide gave was this: provided they had survived any incoming enemy missiles to begin with, they would have had standing orders to remain in the silo for up to 30 days and wait for further instructions to come by radio or phone. 30 days is as long as their supplies of air, food and water would have lasted. If no orders came they were to consider themselves automatically released from duty … and basically left to fend for themselves. That would have meant waiting for suffocation in the silo – or committing suicide to speed things up – or going up to the surface and into a potential nuclear wasteland, where they wouldn't have had anywhere to go anyway, not even any means of transport … bleak indeed. It's practically impossible to get your head round the whole scenario. Another very antiquated looking detail is the punch-hole tape coming out of one of the electronics racks. In the days of USB sticks and optical storage disks these may appear like something from the Stone Age – but remember this: these metal strips had a durability that no current data storage medium could match. They'd practically last for centuries, whereas our modern-day data storage methods are all very fleeting and unreliable in nature. After the visit to the nerve centre of the launch control centre, some extended tours also go upstairs to the crew's "living quarters". There are just four simple bunk beds and a fitted kitchen – crews of twos would take turns, hence the four-person capacity. And on the level below the launch centre, there's the support equipment … and the escape hatch. You can open the hatch door and peek into the horizontal tunnel that connects to the bottom of a ladder going up a vertical tunnel to the surface. This was in place in case the main entrance area got blocked or destroyed or the blast doors failed to open. 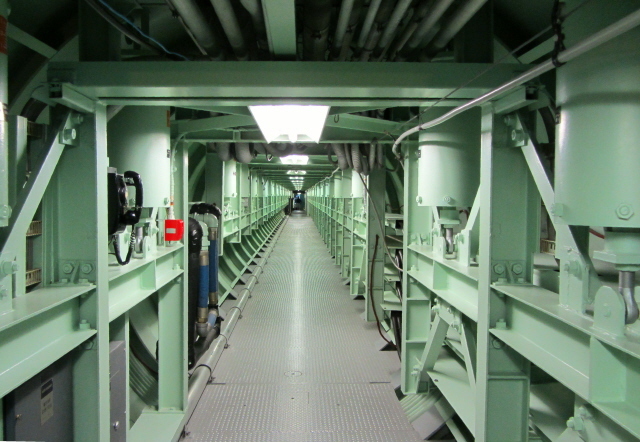 The underground launch control centre is separate from the actual missile silo – but it is connected to it by means of a long tunnel, which also carries all the cabling between the two elements of the complex. At the end of the tunnel you can get another view of the missile in its silo – thanks to two large viewing windows that were specifically cut into the inner silo wall. Seen from here, close up, you get an even better sense of the size, especially the diameter of this missile – 10 feet (3m). The toxicity of the stuff that the crews back then had to deal with is further emphasized by the many warning signs throughout the silo and by the fuel-handling suits hanging from a wall, which look almost like space suits. In some places there are so-called "emergency showers" where staff could jump in if contaminated or on fire … scary, scary, scary. What was an extra cool element towards the end of the long tour was actually clambering down from level 7 to the very bottom (level 8/9) i.e. into flame deflector and looking up the exhaust duct … The concrete flame deflector is split into two halves, one for each of the twin engines. On ignition, four powerful water cannons would also spring into action and pump huge amounts of water at the flames, so that steam would mix with the exhaust fumes – namely in order to dampen the enormous roar of the engines, which could otherwise harm the missile itself. The size of the flame deflector can only give you an indication of the forces involved – as does the view up the exhaust vents. Through these the smoke from the rocket taking off would have been blown out into the open on both sides of the silo – as you can see in action in a video clip in the museum exhibition. These vents are now permanently sealed up at the top … so that no one can fall in, which would surely be lethal, given the ca. 150 feet (45m) distance between the ground surface and the bottom of the silo. These cover the engineering side of the building of the silo, a test launch, and you can do a virtual (repeat) tour of the complex. Nuclear testing is also covered (cf. Atomic Testing Museum), as is the political context of the Cold War. Interpretative panels and display cabinets along the walls further illustrate this, including a historical timeline, 1960s magazines, fallout-shelter supplies, a see-through model of the silo, missile crew uniforms and other artefacts. In the adjacent shop you can buy various items related to the missile silo, including books, a DVD, postcards and such like, as well as a wide range of "Atomic Age" souvenirs. All in all, this is one of the most stupendously amazing attractions it is possible to see as a "nuclear tourist" – or anyone with at least a passing interest in the Cold War and 20th century history. Of course, visitors with a certain leaning towards the technological aspects of such topics will be especially amazed. But even without any particular geeky disposition or Trekkie mindset most visitors are evidently impressed by this unique "museum". For me, this four and a half hour tour of the Titan II silo was absolutely one of the coolest things I have ever done on my explorations of the nuclear legacy of the USA or elsewhere (see also under 'dark combinations' below). Location: at 1580 W. Duval Mine Rd., Sahuarita, Arizona, 85629 – ca. 25 miles (40 km) south of Tucson, Arizona, USA. Access and costs: only reachable by car; access by guided tour; there are various tour offers at different price levels, the more comprehensive ones quite expensive, but worth it. Details: to get to the Titan silo site you need to drive your own vehicle; there is no public transport. Take Interstate 19 south of Tucson in the direction of Green Valley and Nogales, Mexico, and at Sahuarita take exit 69 and head west on W Duval Mine Rd – the turn-off to the access road for the silo museum is just after the intersection with La Canada Drive. Keep going, following the slight right bend of the road. There is plenty of parking space (free) at the museum. You can only enter the complex through the museum building on the southern edge. If you have a tour pre-booked, you need to register at the museum's reception desk. It's also the meeting point if you're joining one of the regular tours. If you have to wait, you can while away the time in the small exhibition. For all special tours, prior reservation is required (see below for more details); only the regular one-hour tours are on a first-come-first-served basis during normal opening hours. Opening times: daily, throughout the year except Thanksgiving and Christmas, from 8:45 to 5 p.m. The first regular tour starts 9 a.m., they are then hourly from then until 4 p.m., and additionally on the half hour at peak demand times (weekends and in the high-season winter months of January to March). Admission, including the regular one-hour tour: 9.50 USD, seniors and groups 8.50 USD, juniors 6 USD (children under 6 free – but think twice whether your toddler has much chance of getting anything out of this other than possibly getting scared!). In the summer prices are lower by 1 USD. Another 90-minute extended version of the regular tour entitled "Beyond the Blastdoor" adds a visit to the crew's living quarters above the launch control centre and in particular a trip down to level 7 at the bottom of the missile for a cool look up – you'll be taken down in batches in the silo's own elevator. These tours take place every first and third Saturday of the month at 9.30 a.m. and costs 17.95 USD (seniors and members of the military 15.95 USD, children, minimum age eight, 9.95 USD); again, numbers are limited to a maximum of 20 participants and you have to reserve a place in advance (same contact details). Finally, a seasonal speciality is the summer-only "Moonlight Tours", which take place between 5 p.m. and 9 p.m. every second Saturday of the month between June and September. These are very family/kiddie-oriented versions of the regular tours, with "special activities" and tasting of "space food" included, all for only 7 USD, even free for kids under 13. On all tours, taller visitors have to wear hard hats – and will soon find out why. I would certainly have come out with several bumps on my head had I not worn one. There are some moderately steep stairs to negotiate but only the Top-to-Bottom long tour really requires a minimum of physical fitness (and a limit on maximum waistline). The regular shorter tours, on the other hand, can even be adapted to visitors with mobility problems – e.g. bypassing the regular stairwell down the main entrance shaft. Wheelchairs can be borrowed on site as well. Dog-owners note that you obviously can't take your pet on any of these tours, but neither are you allowed to leave them in your car … even if the windows are left open – it's against Arizona law, apparently. So you'd have to leave them in a small kennel provided (with quite limited space). Better don't bring dogs in the first place. And one last word of warning: you may not be in any danger from radiation or toxic fuel fumes, but: there are rattlesnakes in the area, signs around the car park and buildings warn of them, and apparently they like to hide precisely in the access stairwell to the silo's main entrance, as my guide pointed out – though I never saw a single snake myself. Time required: between one hour for the regular tours, 90 minutes for the extended tours, 4-5 hours for the full Top-to-Bottom tour and even a whole night for the special overnight tours. Plus between 20-45 minutes for the exhibition – depending on whether you watch all the available videos – and of course driving time to get there. Combinations with other dark destinations: The Titan Missile Museum is affiliated with the huge Pima Air & Space Museum on the southern edge of Tucson, just half an hour's drive or so to the east. The museum also features a few Cold-War-related aspects, not least several bombers from Strategic Air Command (including three B-52s! ), though it's perhaps not quite so dramatic as clambering about in an ICBM silo. But aviation fans can hardly find better places for marvelling at such a huge number of big planes. The Pima Air & Space Museum also offers bus tours of the AMARG 'boneyard' at Davis-Monthan Air Force Base – this is the largest "graveyard" of military aircraft. The facility stores decommissioned strategic bombers and other large gear in absolutely huge numbers. Some are only mothballed, others are broken up for scrap. It is an absolutely unique opportunity to encounter this side of the (strategic) air power of the USA – incomparable to any other. Thematically closer to the Titan Missile Museum are other highlights for nuclear tourists in the south-west of the country, including in particular Trinity – site of the world's first ever atomic bomb test. It's in White Sands Missile Range across the border in New Mexico, a few hours' drive to the east. However, Trinity's ground zero site itself is accessible on only two Open House Days a year, so timing it right is crucial. Much more accessible, year-round, is the National Museum of Nuclear Science & History in Albuquerque, another couple of hours' drive, north of the White Sands Range. The focus here is decidedly on the Cold War and its weaponry. And the outdoors exhibit area includes a number of ICBMs .. amongst them also a whole Titan II missile as well, in sections, with detached warhead/RV, but: with engines still attached to the first stage! Much further away, in South Dakota, another decommissioned ICBM silo has been converted into a museum catering for nuclear tourists, in this case for a second-generation solid-fuel Minuteman II missile silo (the precursor for the current Minuteman III). In a way this counterpart to Titan may be a bit more representative of the current ICBMs, then, but at the same time it's the less impressive size-wise. However, I'm sure that if you're interested in seeing the one, you have to be also interested in seeing the other. Due to South Dakota's remoteness, I have personally not yet managed this, but it remains very high on my US-travel wish-list! Another good place for seeing ICBMs is the US Air Force Museum in Dayton, Ohio, which I did go to once. It has as part of its Cold War section a separate gallery of big missiles, all standing upright next to each other, including not only a Minuteman and a Titan, but also an MX Peacekeeper with multiple warheads, the deadliest of all ICBMs ever devised for the West. To see a former "enemy" counterpart in the Eastern Bloc – i.e. a silo with a missile that was most probably programmed to hit the USA had World War Three broken out – you'd have to travel to the other side of the world to Ukraine and go to the Strategic Missile Force Base at Pervomaysk; they also have on display an SS-18 "Satan", the Soviet Union's heaviest and deadliest ICBM ever. Combinations with non-dark destinations: not much in the immediate vicinity … except perhaps the historic Mission San Xavier del Bac that you pass driving down on I-19 en route from Tucson. More is offered in Tucson itself, which can also serve as a base for excursions further afield, or as a stopover to New Mexico or the many national parks and other top-range attractions further north – see under 'combinations' in the entry for AMARG 'boneyard' and Pima Air & Space Museum for a few suggestions.